Most aquatic plants are aggressive growers. Avoid the most aggressive plants and never plant nonnative varieties. Aquatic plants at retail stores or from ponds with nonnative species will likely be harboring eggs or young of pest species that could take up residence in your pond. Try to locate a local plant source for plants native to your area. These plants will be better adapted to your pond. 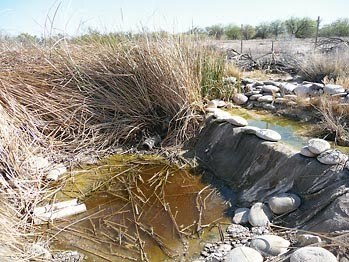 This is difficult since most wetlands are protected and state law protects all native plants. Contact the preserve manager and get permission to remove a set number of aquatic plant parts or seeds. Most aquatic plants can easily be grown from cuttings. By only removing a few pieces of the original plant, it should recover rapidly leaving little evidence of disturbance at the site. Ask around at water garden club meetings to locate other ponds planted with native plants. Most established ponds are regularly thinned to prevent over growth, this can be an excellent source and requires no permit. Edge plants like deergrass (Muhlenbergia rigens) are readily available at local plant nurseries that specialize in native plants. Deergrass can be planted in the pond, at or above the water line or just outside of the pond. If planted outside of the pond give it supplemental water once or twice a week. This pond planted with native bullrush became overgrown and required a complete overhaul. 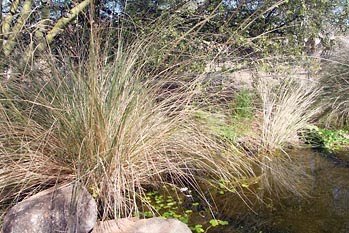 Plant the edges of your native pond with Deergrass for shade and cover. In the pond, Marshpennywort will provide fish and frogs places to hide.